Just 200 kilometers west of the resort destination of Cancún is Chichén Itzá, widely considered to be one of Mexico's best-restored archaeological sites. With only the briefest of interruptions, Chichén Itzá served as a sacred Mayan site for more than 700 years, and by the 11th century had become the political and religious capital of a revived Mayan empire under Toltec rule. Now a UNESCO World Heritage Site, Chichén Itzá is one of the country's most popular tourist attractions luring more than a million visitors annually and ensuring its place on the must-see list of any traveler heading to the beautiful Yucatán Peninsular. Mayan for "near the well of the Itzá," Chichén Itzá was founded around AD 450 by Mayan tribes migrating from the south and is believed to have remained occupied long after they left. Research suggests that Toltec tribes from the central Mexican highlands also visited this part of Yucatán in the 7th century, mingling with the resident Maya. The merging of these advanced civilizations resulted in a renaissance of Mayan architecture in which Toltec influences dominated, leading to Chichén Itzá's remarkable similarity to the old Toltec capital of Tollán. At the time of the Spanish Conquest in 1533, Chichén Itzá was virtually uninhabited, though it remained a place of pilgrimage. By the 19th century, the site had become a place of a different sort of pilgrimage as archaeologists from around the world visited and unearthed many of its most important structures. 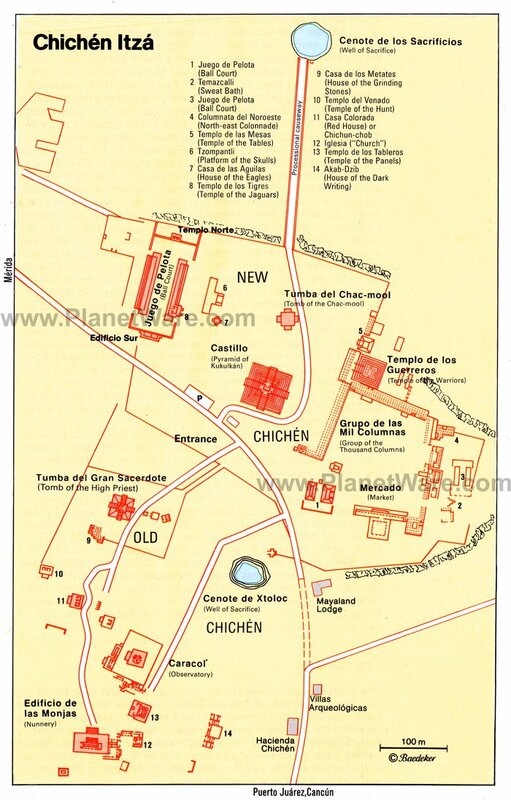 Chichén Itzá's archaeological zone covers eight square kilometers, only some of which has been excavated. Toltec influences at Chichén Itzá are principally seen in the buildings making up the northern group, including the site's famous Chacmools, statues of reclining figures holding sacrificial vessels with their heads turned to one side that served as temple guardians. Other notable Toltec statues are Los Atlantes, stone carvings of warriors supporting the site's temple roofs and altars. You'll also see many references to the plumed serpent, Kukulkán, along with scenes of battles and sacrifices, which appear far more often here than is usual in Classic Maya art. The Pyramid of Kukulkán (El Castillo) dominates the northern part of the site and was built in accordance with strict astronomical and astrological rules. Standing 30 meters high, this excellently restored four-sided pyramid impresses with its classic simplicity. Notable features include its nine-tier terracing and four stairways, one on each side, symbolizing the nine heavens and the four points of the compass. Also of interest are the large serpent heads at the feet of the stairways leading to the upper platform on which the actual Temple of Kukulkán stands, its main entrance flanked by a pair of Toltec serpent columns (a pure Mayan-style temple was discovered under the temple, crowning an even older pyramid). For a truly unforgettable experience, try to plan your visit to coincide with the equinoxes (March 21st and September 21st / 22nd) when the Kukulkán Pyramid becomes the scene of a spectacular shadow show, as the setting sun falls on the corners of El Castillo's nine terraces and casts an undulating shadow onto the west-facing wall of the north staircase. Running all the way down the edge as far as the great snake's head at the foot of the pyramid, the effect is of a huge serpent slithering earthwards. Standing on a platform east of El Castillo is the Temple of the Warriors (Templo de los Guerreros), a magnificent structure comprising several spacious columned halls that unmistakably mimic the larger version of the Temple of the Morning Star at Tula. Several rows of square pillars guard the foot of the stairway, at the top of which squats a Chac-mool. The main temple entrance is again flanked by two massive serpent columns, heads on the ground and tails pointing skyward. Behind them, four atlantes support a large stone altar where archaeologists uncovered the remains of an earlier, smaller Temple of the Warriors concealed inside the pyramid. Adjoining the Temple of the Warriors on its south side is the Hall of the Thousand Columns (Grupo de las Mil Columnas), believed to have served as an indoor market or place of assembly. Nearby are a small ball court (Juego de Pelota); the Mercado (Market); and a steam bath (Temazcalli), of which the vestibule, the bath itself, and the heating room can still be seen. A hundred meters or so north of El Castillo lies the Tomb of Chacmool (Tumba del Chacmool) where, more than 100 years ago, French archaeologist Le Plongeon found a stone figure, which he christened Chac-mool. The structure is also known as the Venus Platform due to its interesting reliefs featuring both Kukulkán's symbol along with that of the Morning Star. North of the Tomb of Chacmool, a six-meter-wide causeway runs for 300 meters to the large sacred cenote - Cenote Sagrado, or Cenote de los Sacrificios - the existence of which was probably the reason for the Maya settling here. This almost perfectly round natural water hole is 60 meters across, its sides plunging 24 meters to the surface of the water below, itself some 82 meters deep. From the 7th century until after the Spanish Conquest, the cenote was a place of pilgrimage, with the sweat bath at the water's edge serving a ritual function, and in times of drought precious objects and even human sacrifices being thrown in as offerings to the Rain God Chac. Between 1904 and 1907, a number of exploratory dives were made that found 50 human skeletons - mostly men and children - together with numerous artifacts of ceramic, stone, gold, copper, and jade. Further exploration in the 1960s, carried out at greater depths, brought to light another 4,000 such objects, some made of copal (resin), along with rubber and wooden dolls and human and animal bones. Not far from Cenote Sagrado is a large square platform called Tzompantli (Náhuatl), the Wall of Skulls. This rather gruesome site served as a base for the stakes on which the decapitated heads of human sacrifices were impaled, hence the reliefs consisting of rows of skulls decorating the sides. Next to Tzompantli stands a smaller platform known as the House of the Eagles (Casa de los Aguilas), its stairway embellished with stone serpents and its walls adorned with reliefs of eagles and jaguars holding human hearts in their claws, symbols of the two orders of Toltec warrior. Like most Mayan cities, Chichén Itzá had several arenas built for ritual ball games. Seven such courts have been found, the largest measuring 146 meters by 37 meters with vertical walls almost nine meters high, in the center of which is a heavy stone ring with serpent ornamentation. The game involved hitting a hard rubber ball through the stone rings using only the elbow, knee, or hip while the ball, representing the sun, was not permitted to touch the ground lest its symbolic course be interrupted. Transgressions led to the loser being ritually sacrificed, evidence of which can be seen in the reliefs on panels decorating the bases of the walls showing players being decapitated. Also of interest are the small temples - the Edificio Sur and the Templo Norte - dedicated to the gods of the Sun and Moon. The Temple of the Jaguars (Templo de los Tigres) occupies a platform built into the southeast wall of the ball court and takes its name from the carved stone animal in the lower shrine. The upper temple, reached by a steep stairway at the side, looks westwards onto the ball court. As in the Temple of the Warriors, serpent columns flank the entrance. Also of interest is the façade with its friezes, the majority of which depict jaguars, while still visible inside are murals depicting a battle between the Maya and the Toltec. In the southern group of buildings comprising what is known as Old Chichén (Chichén Viejo) is the Tomb of the High Priest (Tumba del Gran Sacerdote). When excavated, this 10-meter-tall pyramid was found to contain seven tombs and some valuable artifacts. Just a short distance from the Tomb of the High Priest is one of the most interesting of all the buildings at Chichén Itzá, the Caracol (Snail), thought to have been an observatory. Inside the circular building stands a two-tier platform and a passageway winding upwards in a gently ascending spiral. Of special interest are the narrow slits in the walls, positioned to allow the sun's rays to penetrate the building for a few seconds twice a year, a simple but reliable method used by priests to accurately determine the date. The elaborately ornamented Nunnery (Edificio de las Monjas) is a superb example of the Mayan Chenes style, with virtually every inch of the façade being decorated with symbols of the Mayan Rain God, Chac. The so-called Church (Iglesia) is a particularly fine example of Puuc architecture, an early style in which the façades are decorated with geometric patterns and animals as well as Chac masks. Also of interest is the Temple of the Panels (Templo de los Tableros), with its fine reliefs of Toltec warriors and jaguars, as well as the Building of the Unknown Writing (Akab Dzib), so named because of the undeciphered characters above the door of the second room. Other notable buildings are the Temple of the Window Lintel (Templo de los Dinteles), the Red House (Casa Colorada or Chichan-chob), and the Cenote Xtoloc, an ancient reservoir. Hacienda Chichen: colonial-style luxury, fantastic location, lush grounds, lovely garden terrace. Hotel & Bungalows Mayaland: mid-range jungle resort, beautiful grounds, palm-lined pools, horseback riding, wonderful spa. Hotel Okaan: affordable holistic retreat, remote rainforest setting, multi-level swimming pool, medical spa. Hotel Dolores Alba Chichen: budget hotel, clean rooms, cenote pool, complimentary breakfast. Day Trip Tours from Cancún and Playa del Carmen: The best way to see Chichén Itzá is on a guided tour. The site will have much more significance with a knowledgeable, professional guide to point out the details and explain the history. One exceptional tour, operated out of two locations, is the Early Access to Chichén Itzá with a Private Archeologist from Cancún and the Early Access Chichén Itzá with a Private Archeologist from Playa del Carmen. These are the exact same tours but departing from different towns. From Cancún this is a 10-hour day trip and from Playa del Carmen it is a nine-hour tour. The tour includes hotel pickup and drop-off, early entry to the site, access to parts of the ruins not accessible to the general public, and a guided tour of the site with an archeologist. Visiting on Your Own: You can rent a car and drive to Chichén Itzá from Cancún on your own. The quickest route is along a very straight and boring toll road (180) that will take you a little more than two hours each way. There is nothing to see along this route but it is quick. From Playa del Carmen take 180D, which is also a toll road. Alternatively, you can take the non-toll highway, which goes through numerous towns along the way. It is more scenic but it is ridiculously slow and can add an hour or more each way to your trip. If you want to see the towns, take the toll road one way and the free highway on the return trip. While there's more than enough to keep you busy when visiting Chichén Itzá, those with a little more time can enhance the experience further by visiting nearby Mayan communities, with their traditional cooking, religious ceremonies, and traditional arts, usually best accomplished as part of an overnight stay. A nearby attraction worth visiting is Balankanché, with its many ancient caves and large collections of pottery and idols, part of an extensive labyrinth of underground caverns and waterways. Also of interest is the 16th-century church of San Bernardino in the town of Valladolid, 42 kilometers east of Chichén Itzá. The town is also famous for its cenotes, natural waterholes accessible via a gangway leading down to the water's edge some 45 meters below. Particularly popular is Cenote Dzitnup, a delightful spot with warm cobalt-blue water.